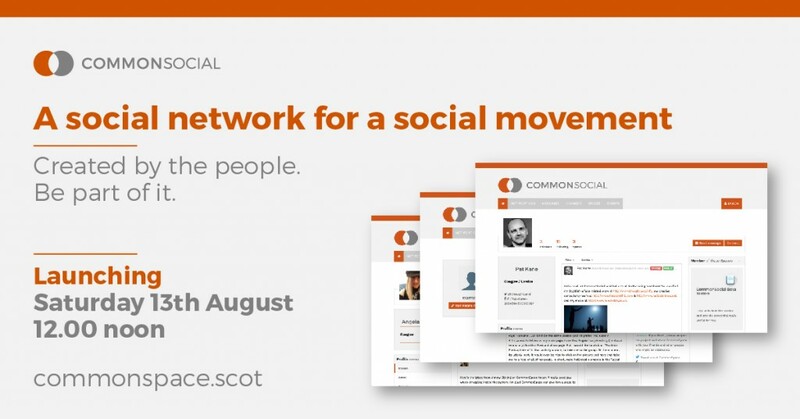 On Saturday we’ll finally be launching CommonSocial, a brand new social network for Scotland created specifically to serve and nurture the explosion in political and social participation Scotland has enjoyed since the independence referendum campaign. It’s been a pretty huge project and it’s taken us nearly two years to complete. Building a social network is no easy task; harder still is building a social network that works alongside a rolling news website, and launching that first. CommonSpace, and the new CommonSocial, is funded by Common Weal, which is funded entirely by supporters, members of the public. It’s totally independent and free from the influence of advertising. CommonSocial has very much been created by the people and for the people. As a media model, CommonSpace is unique in comparison to everything I’ve seen before. This really is something innovative for Scotland, and it’s great to see new ideas coming to fruition. The concept of CommonSpace, right from the beginning, was to have these two components working together. CommonSpace would have a full time team of journalists bringing fresh and original news, and CommonSocial would be the space to dissect the news, debate it, and, most importantly, to network and organise. Through CommonSocial, the users – the very people who funded its creation and sustain it – have access to news, information and the tools to empower action. It can be about local communities or national issues. It can be for issues ranging from Scottish independence to fracking, TTIP or land reform. It can be about ideas, or it can be about strategy. It’s whatever you want it to be. Much like Facebook and Twitter, CommonSocial will provide the usual newsfeed elements, but some of its strongest features are in the ‘spaces’ and ‘events’ sections. Users join ‘spaces’ on CommonSocial related to their interests; groups, essentially, where they can meet others with a shared focus. Not only are ‘spaces’ a great way to find other people interested in the same issues as you, but they’re the perfect tool for different local groups to use to network with one another and maintain communication, something that, according to the feedback we’ve been getting, hasn’t been easy with the current tools available digitally. Something else was needed, and CommonSocial provides it. Through our events function – something I’m particularly excited about – users can post their own events to their calendars, as well as view all the other events that they might be interested in based on their stated interests. The key to this is how visual and easy it all is. For me, this is like trying to explain the concept of Facebook to my 76-year-old dad: the truth is, unless you’re on there and see it in action, it’s near impossible to understand why anyone would use it. I’d say the same about the events tab; I might not be doing it justice in my description here, but believe me, when you see it, you’ll get it. CommonSocial opens fully to the public on Saturday 13 August at 12noon, but you can register on the CommonSpace news site right now to make sure your account is set up and ready to use when it all goes live. 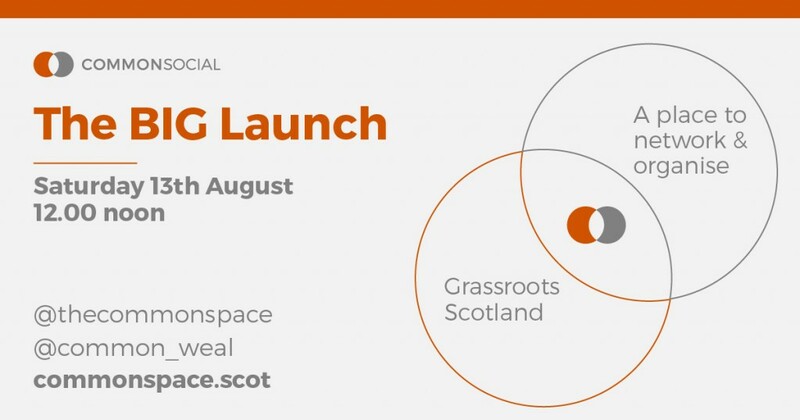 Needless to say, the more people who use the full functionality of CommonSpace and CommonSocial, the more useful it will be for us all, so I really hope you’ll jump aboard on Saturday and see what it’s all about it. This has been created with the needs of users entirely at its heart, and we imagine it will be in a permanent state of development; we’ll continue tweaking it and changing it depending on what users want and need from it. Together we can build it, and together we can build a better Scotland. Sounds good, but the National Yes Registry is developing a similar platform and launches in September. Unfortunate lack of communication there? > Sounds good, but the National Yes Registry is developing a similar platform and launches in September. Unfortunate lack of communication there? Perhaps, but from what I’ve heard the NYR is doing something a bit different from us. We’d love to work together with them though! Looking foward to seeing it & using it. As someone who regularly donates to Common Weal I’m alwaysa bit disappointed in the look & operation of the web site & Common Space. A curiously “dead” & “closed” feel to the graphics & interface. Going by the above snapshots this new yin looks the same. I notice that the level of comment & engagement with posts on Common Space is very low compared to Bella & other pro-independance spaces. Maybe your graphic folk are a bit too cool for your own good? it’s cos you have to sign in to comment. that was a real mistake on their part i think. not sure why they did it. possibly to avoid the cost of moderating it? > it’s cos you have to sign in to comment. that was a real mistake on their part i think. not sure why they did it. possibly to avoid the cost of moderating it? It’s certainly true that we benefit enormously from not having to moderate away spam comments, but I think that like most things this wasn’t a decision which was made so much as just happened. We initially were using a platform which didn’t allow us to have open comments and now we’ve changed to a more versatile system I don’t think the topic actually came up. Ultimately there are solutions to spam like CAPTCHAs and so on and if you think Commonspace should have an open comment system, please do tell Angela and the other folk and we’ll make it happen. Will this work alongside the National Yes Registry? > Will this work alongside the National Yes Registry? No reason why not. I’d personally love to have more information about the technical aspects of what NYR will be doing so we can figure out the best ways to make our systems work together! My wee gripe aside. Very well done all of you at Common Space. This must have been an enormous amount of work. Looking forward to using it & networking. It’s important that this network has branches going out the way, permeable edges to allow new folk and sceptics to join in & be welcomed.